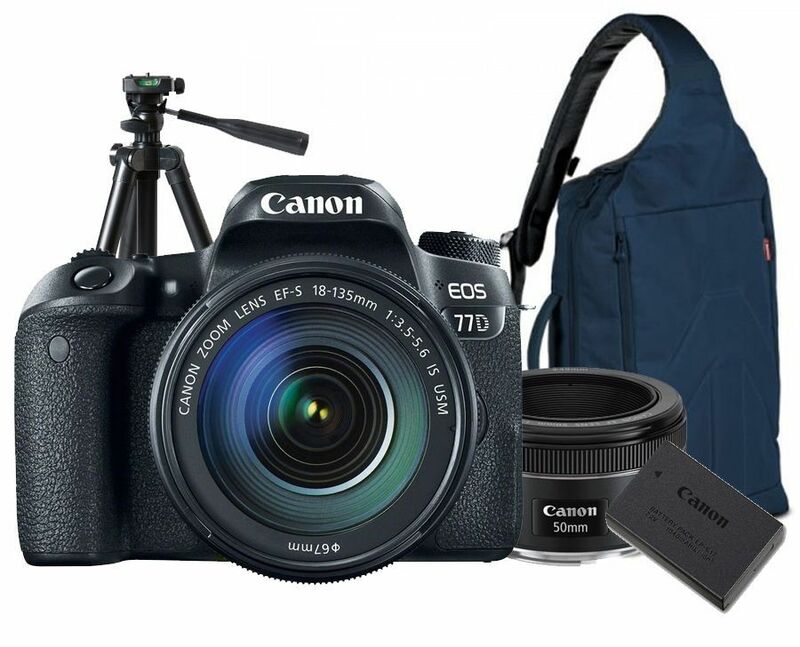 If you’re passionate about photography, than this DSLR is perfect to help you start your creative journey. With easy to understand controls, you will begin to experiment with different shooting modes instantly and develop your photography skills. If you’re unfamiliar with camera vocabulary the new DSLR’s guided interface will help you learn as you shoot. With easy-to-understand displays, the images onscreen will guide you on the different shooting effects. The EOS 77D offers you full control, see your settings at a glance via the top panel LCD found in high-end models and a dual control wheel to adjust setting like aperture and shutter speed quickly. Love posting and sharing your images with your mates? Easily share all your EOS 77D images to your social networks with the Canon Camera Connect App. For a constant connection, Bluetooth® lets you browse and download photos onto your smart phone without having to take the EOS 77D from your bag after the initial connection. Perfect for anyone interested in getting into photography, the camera’s inbuilt visual guide will teach you the different shooting modes as you become more familiar with different settings. The 45 point cross type Auto Focus will allow you to pinpoint the exact subject to focus on, whether you are taking photos of your pet running around or a small flower in the garden, choosing between zone and single Auto Focus will help you achieve outstanding results. Incredible image quality in all situations thanks to a large 24.2 megapixel CMOS sensor and DiG!C 7 processor. This means better details, clean, crisp images that are large enough for you to print. The cameras deliver pin-sharp precision, and with the ability to shoot at six frames a second, capturing fast moving subjects with ease. High-speed writing is supported when a UHS-I compatible SD card is used. Multimedia cards (MMC) cannot be used (card error will be displayed). Removes dust adhering to the low-pass filter. Self-cleaning executed automatically (taking approx. 2 sec.) when power is turned on or off. Manual execution also possible (taking approx. 7 sec.). After the cleaning is performed, the camera will automatically restart (power OFF to ON). The coordinates of the dust adhering to the low-pass filter are detected by a test shot and appended to subsequent images. The dust coordinate data appended to the image is used by the provided software to automatically erase the dust spots. Values for recording pixels are rounded to the nearest 100,000. JPEG images are generated in the set aspect ratio. RAW images are generated in [3:2], and the set aspect ratio is appended. * Indicate an inexact proportion. The numbering of captured images will continue even after you replace the camera's card. When you replace the camera's card, the numbering will be reset to start from 0001. If the new card already contains images, the numbering will continue from the last recorded image in the card. Resets the file number to 0001, and creates a new folder automatically. RAW + JPEG Simultaneous Recording Simultaneous recording is possible using a combination of RAW and JPEG (Large). In Basic Zone modes, [Auto] will be set for and of the mode, and [Standard] will be set for other modes. In Creative Zone modes, you can select or set the Picture Style. [Auto] is the default setting for [User Def. 1-3]. * Effective also in twilight and sunset. Magenta/green bias: ±9 levels Corrected in reference to the current WB mode's color temperature. In the One-Shot AF mode with evaluative metering, AE lock takes effect when focus is achieved. Possible with all metering modes. Shutter Lag Time 1. With SW-1 ON, time lag between SW-2 ON and start of exposure: approx. 0.070 sec. 2. Time lag between simultaneous SW-1/SW-2 ON and start of exposure: approx. 0.250 sec. Time lag with the aperture stopped down by 3 stops or less from the open aperture. Excludes AF operation time. Flash firing, E-TTL II metering, Flash mode, Wireless functions, Flash zoom, Shutter synchronisation, Flash exposure compensation, Flash exposure bracketing and Clear settings. The radio wireless flash functions can be set from the camera. The setting options for both (1) and (2) will differ depending on the Speedlite used. 2. High-speed continuous shooting Max. approx. 6.0 fps. Max. approx. 6.0 fps. Maximum continuous shooting speed with 1/500 sec. or faster shutter speed, maximum aperture (varies depending on the lens), Anti-flicker shooting set to Disable, with a fully-charged Battery Pack LP-E17 and at room temperature (73°F/23°C). Maximum continuous shooting speed with 1/500 sec. or faster shutter speed, maximum aperture (varies depending on the lens), Anti-flicker shooting set to Disable, with a fully-charged Battery Pack LP-E17 and at room temperature (73°F/23°C). With the AF mode set to One-Shot AF and the Image Stabilizer turned off when using the following lenses: EF 300mm f/4L IS USM, EF 28-135mm f/3.5-5.6 IS USM, EF 75-300mm f/4-5.6 IS USM, EF 100-400mm f/4.5-5.6L IS USM. Dual Pixel CMOS AF is possible with all EF and EF-S lenses. Contrast AF is not provided. Magnifying the image by 5x or 10x for manual focus possible. AE lock possible. The metering timer can be changed. AE lock possible. The active metering timer can be changed. Magnifying the image by 5x or 10x for manual focus possible (not possible during movie shooting). * When the aspect ratio is 16:9, vertical viewfinder coverage is approx. 93%. Items Pressing the Quick Control button displays the Quick Control screen during viewfinder shooting, Live View shooting, movie shooting and playback. After selecting an item, you can select contents by operating the Main Dial. RAW images can be printed. Video is not displayed unless the video format appropriate for the connected TV set, [NTSC] or [PAL], is set. With the AC Adapter AC-E6N and DC Coupler DR-E18, AC power operation is possible. Battery Check Automatic battery check when the power switch is turned ON. Displayed in 4 levels. * Normally 10 sec. is set. 30 sec. will be set for function setting, Live View shooting, image playback, etc. Recharge time: approx. 8 hrs. To become capable to maintain the right date/time for 3 months after main battery power depletion. * The number of AF points, cross-type AF points and Dual cross-type AF points vary depending on the lens used. ** Compatible with iOS® versions 8.0/8.1/8.2/8.3/8.4/9.0/9.1/9.2/9.3/10.0, Android™ smartphone and tablet versions 4.1/4.2/4.3/4.4/5.0/5.1/6.0/7.0. Data charges may apply with the download of the free Canon Camera Connect app. This app helps enable you to upload images to social media services. Please note that image files may contain personally identifiable information that may implicate privacy laws. Canon disclaims and has no responsibility for your use of such images. Canon does not obtain, collect or use such images or any information included in such images through this app. *** Compatible with Android™ smartphone and tablet versions 4.0/4.1/4.2/4.3/4.4/5.0/5.1/6.0/7.0. ^ Compatible with select smartphone and tablet devices (Android™ version 5.0 or later and the following iOS® devices: iPhone 4s or later, iPad 3rd gen. or later, iPod Touch 5th gen. or later) equipped with Bluetooth® version 4.0 or later and the Camera Connect App Ver. 2.0.20. This application is not guaranteed to operate on all listed devices, even if minimum requirements are met.